Any good hotelier or restaurant owner knows that it’s essential to keep up with the latest décor trends. To help you on your way, read on for a few insider tips on the top wallcovering trends for 2018. Once seen as a little too reminiscent of the 1970s, wallcoverings have enjoyed a huge revival lately with innovative and engaging pieces increasingly pulling double duty as décor and focal point for any room. Complimented with a few carefully selected accessories, wallcoverings can instantly transform any space, so they are definitely a design feature worth considering the next time you’re planning a venue revamp. 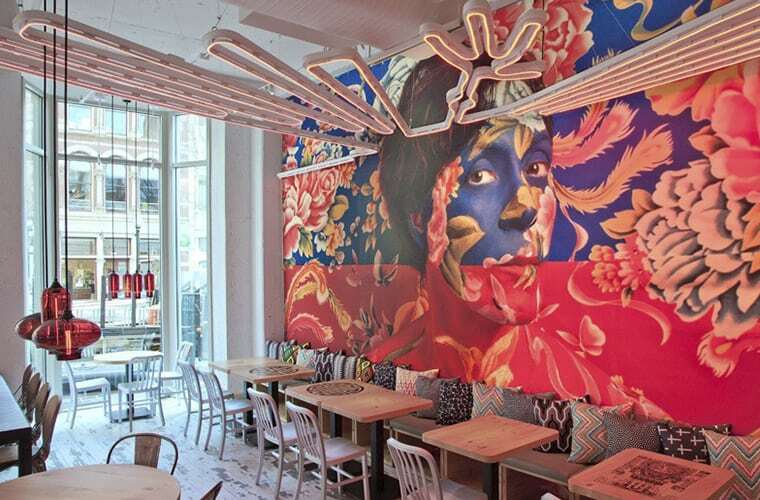 There’s been some amazing uses of woven ethnic fabrics as quirky wallcoverings recently. 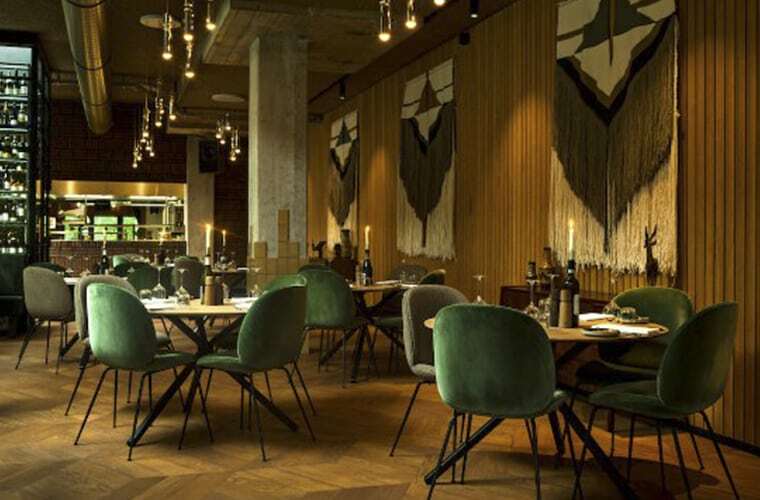 A number of restaurants with their fingers firmly on the style pulse are already building in vast amounts of texture and adding a cosy, intimate feeling to their walls by layering fabric wall hangings of various sizes to create a bright and vibrant collage. Using a mix of plain and patterned wall hangings adds interest to otherwise plain walls and creates depth, so it’s definitely something to consider if your premises could benefit from a little added colour. A new trend in wallcoverings has emerged thanks to the talents of some of the UK’s best mural painters. 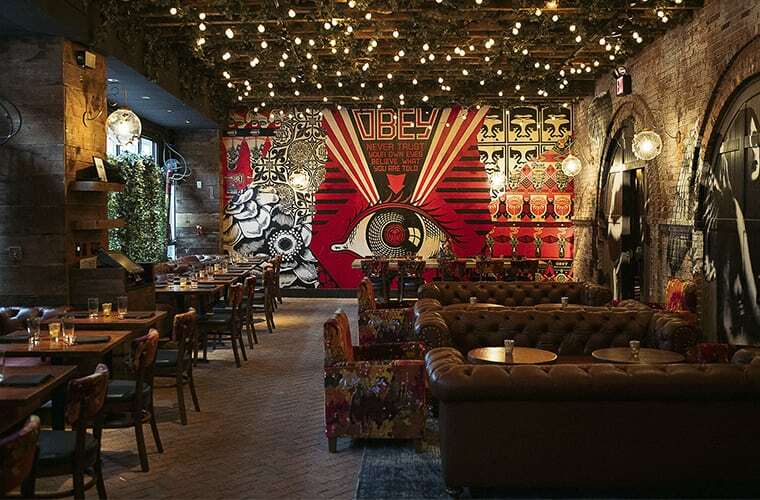 Seen in some of the country’s higher end restaurants and boutique hotels of late, murals are a creative dream and whatever your menu or drinks genre, mean you can create something that’s truly unique to your business. Murals are a major talking point for visitors and allow you to tell a story – whether this is about the city your business is situated in or in the case of one high-end London restaurant, a picturesque landscape featuring game birds and cattle which the establishment is famous for serving in its dishes. 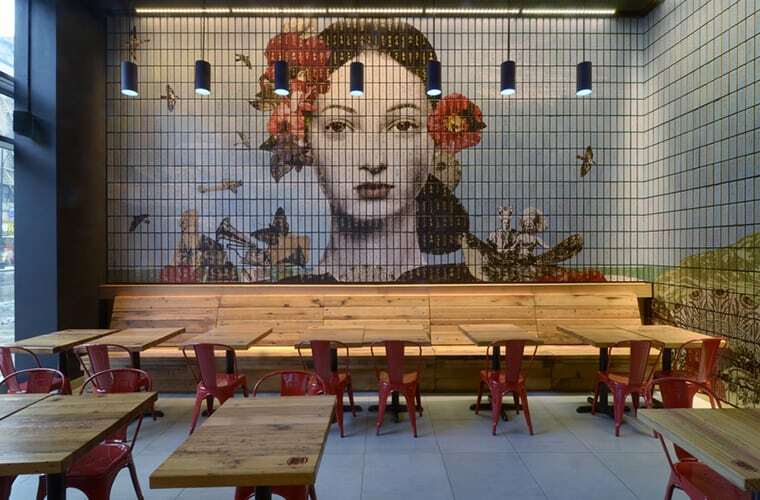 Murals are strong statements but, you don’t need to go for bright colours and intricate designs if that’s not in line with your brand identity – use the essence of the format but update it to suite your bar or restaurant business. One of the biggest wallcovering trends of 2018, photo walls are popping up in lots of hospitality settings. From simple graphics to huge natural scenes that bring the outdoors in, photo walls are a far more cost-effective wallcovering option in comparison to murals but give a similar effect. Photo walls are easy to customise to your unique requirements and relatively simple to install, so are well-worth thinking about if you’re looking to update your décor with something striking and attention grabbing.